Get a website that gets results. Here at Conversion Leverage, we’re really into the little things that make a big difference. When it comes to growing your following on Twitter, and getting more engagement and more shares on your website content, one of those little things is a Twitter feature called Twitter Cards. If you’ve never heard of Twitter Cards before, don’t worry. Until a few months ago, I’d never heard of them either. Twitter Cards are easy to set up, and help you stand out when people share your content on Twitter. You can increase your engagement, get more traffic and grow your Twitter following. I’ll show you what they look like in a minute; and if you want to use Twitter Cards on your own website, I made a quick how-to video to show you how to set them up. What exactly is a Twitter Card? This is obviously way better than a regular old tweet. You’ve got a nice big image, a title for the content that was linked to, a link to the author’s Twitter profile, a couple of lines of text for a description, and another link to read the post. It’s pretty clear how using Twitter Cards can increase your engagement and help you grow your brand and your following. Follow the simple steps in this video to learn how to set up Twitter Cards on your site today. I’ve put some helpful links below the video. Step 1: Install the WordPress SEO plugin on your site. Step 2: Configure the plugin so it works with your Twitter account. Step 3: Publish a post or page and set a Featured Image, Title Tag and Meta Description. Step 4: Validate your Twitter Card. Step 5: Test it out. Click here to tweet a link to this post and see my Twitter Card in action..
Like This Post? Enter your email and we’ll send you the next one. Get Conversion Leverage email updates! 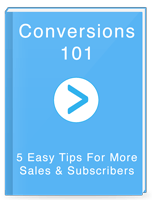 Have you read our free conversion guide? It's like Bruce Lee... small, but pretty awesome. Want to know what tools we use? We've tested what's out there. These are our favorite conversion tools.